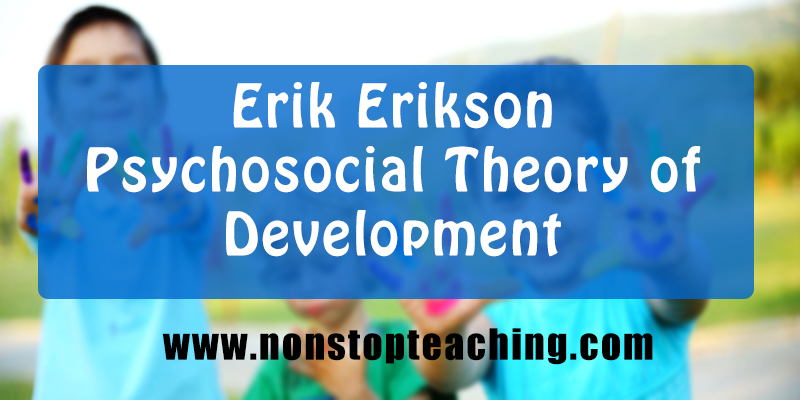 Erik Erikson was a psychoanalyst who developed the theory of psychosocial development. He was born on June 15, 1902 in Karlsruhe Germany. His classic work "Childhood and Society" set forth his theory of the life cycle. He believed that the achievements and failures of earlier stages influence later stages, whereas later stages modify and transform earlier ones. Erikson's conceptualization of psychosocial development based its model the epigenetic principle of organismic growth in utero. Erikson views psychosocial growth occurs in phases. Erikson’s theory was largely influenced by Sigmund Freud. But Erikson extended the theory and incorporated cultural and social aspects into Freud’s biological and sexually oriented theory. It’s also interesting to see how his ideas developed over time, perhaps aided by his own journey through the ‘psychosocial crisis’ stages model that underpinned his work. Like other influential theories, Erikson’s model is simple and well designed. The theory is a basis for broad or complex discussion and analysis of personality and behaviour, and also for understanding for facilitating personal development – of self and others. It can help the teacher in becoming more knowledgeable and at the same time understand the various environmental factors that can affect his/her own and his/her students’ personality and behaviour. Each stage involves a psychosocial crisis of two opposing emotional forces. A helpful term used by Erikson for these opposing forces is ‘contrary dispositions’. Each crisis stage relates to a corresponding life for the stage and its inherent challenges. Erikson used the word ‘syntonic’ for the first-listed positive disposition in each crisis (e.g., trust) and ‘dystonic’ for the second-listed negative disposition (e.g., mistrust). To signify the opposing or conflicting relationship between each pair of dispositions, Erikson connected them with the word ‘versus’. If a stage is managed well, we carry away a certain virtue or psychosocial strength which will help us through the rest of the stages of our lives. Successfully passing through each crisis involves ‘achieving’ a healthy ratio or balance between the two opposing dispositions that represents each crisis. On the other hand, if we don’t do so well, we may develop maladaptation and malignancies, as well as endanger all our future development. A malignancy is the worse of the two, and involves too little of the positive and too much of the negative aspects of the task, such as a person who can’t trust others. A maladaptation is not quite as bad and involves too much too much of the positive and too little of the negative, such as a person who trusts too much. The first stage is the infancy, approximately the first year or year and a half of life. The task is to develop trust without completely eliminating the capacity for mistrust. If mom and dad can give the newborn a degree of familiarity, consistency, and continuity, then the child will develop the feeling that the world - especially the social world - is a safe place to be, that people are reliable and loving. Through the parents' responses, the child also learns to trust his or her own body and the biological urges that go with it. If the parents are unreliable and inadequate, if they reject the infant or harm it, if other interests cause both parents to turn away from the infants needs to satisfy their own instead, then the infant will develop mistrust. He or she will be apprehensive and suspicious around people. Too much trust leads to maladaptive tendency which Erikson calls Sensory Maladjustment: Overly trusting, even gullible, this person cannot believe anyone would mean them harm, and will use all the defences at their command to find an explanation or excuse for the person who did him wrong. Worse is the malignant tendency which Erikson calls Withdrawal which is characterized by depression, paranoia, and possibly psychosis. If the proper balance is achieved, the child will develop the virtue hope, the strong belief that, even when things are not going well, they will work out well in the end. One of the signs that a child is doing well in the first stage is when the child isn't overly upset by the need to wait a moment for the satisfaction of his or her needs: Mom or dad don't have to be perfect; I trust them enough to believe that, if they can't be here immediately, they will be here soon; Things may be tough now, but they will work out in the end. This is the same ability that, in later life, gets us through disappointments in love, our careers, and other domains of life. The second stage is the early childhood, from about eighteen months to three or four years old. The task is to achieve a degree of autonomy while minimizing shame and doubt. If mom and dad (and the other care-takers that often come into the picture at this point) permit the child, now a toddler, to explore and manipulate his or her environment, the child will develop a sense of autonomy (independence). The parents should not discourage the child, but neither should they push. A balance is required. People often advise new parents to be "firm but tolerant" at this stage, and the advice is good. This way, the child will develop both self-control and self-esteem. On the other hand, it is rather easy for the child to develop instead a sense of shame and doubt. If the parents come down hard on any attempt to explore and be independent, children will soon give up with and assume that they cannot and should not act on their own. We should keep in mind that even something as innocent as laughing at the toddler's efforts can lead the child to feel deeply ashamed, and to doubt his or her abilities. And there are other ways to lead children to shame and doubt: If you give children unrestricted freedom and no sense of limits, or if you try to help children do what they should learn to do for themselves, you will also give them the impression that they are not good for much. If you aren't patient enough to wait for your child to tie his or her shoe-laces, your child will never learn to tie them, and will assume that this is just too difficult to learn! Shame and doubt sound very negative. Do we really need them? Yes, unless you think it is a good idea to run around naked in public or jump off of buildings. Too much autonomy will leads to maladaptive tendency which Erikson calls impulsiveness, a sort of shameless wilfulness that leads you, in later childhood and even adulthood, to jump into things without proper consideration of your abilities. Worse is too much shame and doubt, will leads to malignant tendency which Erikson calls compulsiveness. The compulsive person feels as if their entire being rides on everything they do, and so everything must be done perfectly. Following all the rules precisely keeps you from mistakes, and mistakes must be avoided at all cost. If you get the proper, positive balance of autonomy and shame and doubt, you will develop the virtue of willpower (determination). One of the most admirable - and frustrating - thing about two- and three-year-olds is their determination. "Can do" is their motto. If we can preserve that "can do" attitude (with appropriate modesty to balance it) we are much better off as adults. Stage three is the early childhood stage. From three or four to five or six, the task confronting every child is to learn initiative without too much guilt. Initiative means a positive response to the world's challenges, taking on responsibilities, learning new skills, feeling purposeful. Parents can encourage initiative by encouraging children to try out their ideas. We should accept and encourage fantasy and curiosity and imagination. This is a time for play, not for formal education. The child is now capable, as never before, of imagining a future situation, one that isn't a reality right now. Initiative is the attempt to make that non-reality a reality. But if children can imagine the future, if they can plan, then they can be responsible as well, and guilty. If my two-year-old flushes my watch down the toilet, I can safely assume that there were no "evil intentions." It was just a matter of a shiny object going round and round and down. What fun! But if my five year old does the same thing... well, she should know what's going to happen to the watch, what's going to happen to daddy's temper, and what's going to happen to her! She can be guilty of the act, and she can begin to feel guilty as well. The capacity for moral judgement has arrived. Do we really need guilt? Very much. The only people that don't feel guilt are called psychopaths. Too much initiative and too little guilt means a maladaptive tendency Erikson calls ruthlessness. To be ruthless is to be heartless or unfeeling or be “without mercy”. The ruthless person takes the initiative alright; they have their plans, wether it’s a matter of school or romance or etc. It’s just that they don’t care who they step on too achieve their goals. Ruthlessness is bad for others, but actually relatively easy on the ruthless person. Harder on the person is the malignancy of too much guilt, which Erikson calls inhibition. The inhibited person will not try things because “nothing ventured, nothing lost” and, particularly, nothing to feel guilty about. They are so afraid to start and take a lead on a project. They fear that if it fails, they will be blamed. A good balance leads to the psychosocial strength of purpose. A sense of purpose is something many people crave in their lives, yet many do not realize that they themselves make their purposes, through imagination and initiative. I think an even better word for this virtue would have been courage, the capacity for action despite a clear understanding of your limitations and past failings. Stage four is the school-age stage from about six to twelve. The task is to develop a capacity for industry while avoiding an excessive sense of inferiority. Children must "tame the imagination" and dedicate themselves to education and to learning the social skills their society requires of them. There is a much broader social sphere at work now: The parents and other family members are joined by teachers and peers and other members of he community at large. They all contribute: Parents must encourage, teachers must care, peers must accept. Children must learn that there is pleasure not only in conceiving a plan, but in carrying it out. They must learn the feeling of success, whether it is in school or on the playground, academic or social. A good way to tell the difference between a child in the third stage and one in the fourth stage is to look at the way they play games. Four-year-olds may love games, but they will have only a vague understanding of the rules, may change them several times during the course of the game, and be very unlikely to actually finish the game, unless it is by throwing the pieces at their opponents. A seven-year-old, on the other hand, is dedicated to the rules, considers them pretty much sacred, and is more likely to get upset if the game is not allowed to come to its required conclusion. If the child is allowed too little success, because of harsh teachers or rejecting peers, for example, then he or she will develop instead a sense of inferiority or incompetence. An additional source of inferiority Erikson mentions is racism, sexism, and other forms of discrimination: If a child believes that success is related to who you are rather than to how hard you try, then why try? Too much industry leads to the maladaptive tendency called narrow virtuosity. We see this in children who aren’t allowed to be children, the ones that parents or teacher push into one area of competence, without allowing the development of broader interests. These are kids without a life: child actors, child athletes, child musician, child prodigies at all sorts. We al admire their industry, but if we look a little closer, it’s all that stands in the way of an empty life. Much more common is the malignancy called inertia. This includes all of us who suffer from “inferiority complexes” that Alfred Adler talked about. If at first you don’t succeed, don’t ever try again! Many of us didn’t do well in mathematics, for example, so we’d die before we took another math class. Good and balanced development of industry and inferiority is a happier thing - that is, mostly industry with just a touch of inferiority to keep us sensibly humble. This virtue called competency. Stage five is adolescence, beginning with puberty and ending around 18 or 20 years old. The task during adolescence is to achieve ego identity and avoid role confusion. It was adolescence that interested Erikson first and most, and the patterns he saw here were the bases for his thinking about all the other stages. Ego identity means knowing who you are and how you fit in to the rest of society. It requires that you take all you've learned about life and yourself and mold it into a unified self-image, one that your community finds meaningful. There are a number of things that make things easier: First, we should have a mainstream adult culture that is worthy of the adolescent's respect, one with good adult role models and open lines of communication. If the teenager looks around and sees nothing but sexism, racism, war-mongering, unbridled materialism, self-centered hedonism, puritanical self-righteousness, etc. - why bother to become an adult? Further, society should provide clear rites of passage - certain accomplishments and rituals that help to distinguish the adult from the child. In primitive and traditional societies, an adolescent boy may be asked to leave the village for a period of time to live on his own, hunt some symbolic animal, or seek an inspirational vision. Boys and girls may be required to go through certain tests of endurance, symbolic ceremonies, or educational events. In one way or another, the distinction between the powerless but carefree time of childhood and the powerful and responsible time of adulthood, is made clear. Without these things, we are likely to see role confusion, meaning an uncertainty about one's place in society and the world. When an adolescent is confronted by role confusion, Erikson say he or she is suffering from an identity crisis. In fact, a common question adolescents in our society ask is a straight-forward question of identity: "Who am I?" Notice how long it takes, in our society, before we have an answer to the parallel question "What do I want to be when I grow up?" Too much Ego Identity leads to maladaptive tendency which Erikson calls fanaticism. A fanatic person believes that his way is the only way. Adolescents are, of course, known for their idealism, and for their tendency to see things in black-and-white. These people will gather others around them and promote their beliefs and life-styles without regard to others’ rights to disagree. The lack of identity is perhaps more difficult still, and Erikson refers to the malignant tendency here as repudiation. To repudiate is to reject. They reject their membership in the world of adults and, even more, they reject their need for an identity. Some adolescents prefer to go to groups that go against the norms to form their identity: religious cults, militaristic organizations, groups founded on hatred, groups that have divorced themselves from the painful demands of mainstream society. They may become involved in destructive activities, drugs, or alcohol, or you may withdraw into their own psychotic fantasies. If you successfully negotiate this stage, you will have the virtue Erikson called fidelity. Fidelity means loyalty, the ability to live by society's standards despite the imperfections and incompleteness and inconsistencies. We are not talking about blind loyalty, and we are not talking about accepting those imperfections. After all, if you love your community, you will want to see it become the best it can be. But fidelity means that you have found a place in that community, a place that will allow you to contribute. If you have made it this far, you are in the stage of the young adult, which lasts (in modern society) from about 20 to about 30. The ages in the adult stages are much fuzzier than in the childhood stages, and people may differ dramatically. The task is to achieve some degree of intimacy, as opposed to remaining in isolation. Intimacy is the ability to be close to others, as a lover, a friend, and as a participant in society. Because you have a clear sense of who you are, you no longer need to fear "losing" yourself, as many adolescents do. The "fear of commitment" some people seem to exhibit is an example of immaturity in this stage. This fear isn't always so obvious. Many people today are always putting off the progress of their relationships: I'll get married (or have a family, or get involved in important social issues) as soon as I finish school, as soon as I have a job, as soon as I have a house, as soon as.... If you've been engaged for the last ten years, what's holding you back? Neither should the young adult need to prove him- or herself anymore. A teenage relationship is often a matter of trying to establish identity through "couple-hood." A teenager might respond to "Who am I?" with "I'm her boy-friend" or "I'm his girl-friend". The young adult relationship should be a matter of two independent egos wanting to create something larger than themselves. Erikson calls the maladaptive form promiscuity, referring particularly to the tendency to become intimate too freely, too easily, and without any depth to your intimacy. This can be true of your relationships with friends and neighbors and your whole community as well as with lovers. The malignancy he calls exclusion, which refers to the tendency to isolate oneself from love, friendship, and community, and develop a certain hatefulness in compensation for one’s loneliness. If you successfully negotiate this stage, you will carry with you for the rest of your life the virtue or psychosocial strength Erikson calls love. Love, in the context of his theory, means being able to put aside differences and antagonisms through "mutuality of devotion." It includes not only the love we find in a good marriage, but the love between friends and the love of one's neighbor, co-worker, and compatriot as well. The seventh stage is the middle adulthood. It is hard to pin a time to it, but it would include the period during which we are actively involved in raising children. For most people in our society, this would put it somewhere between 30 and 60. The task here is to cultivate the proper balance of generativity and stagnation. Generativity is an extension of love into the future. It is a concern for the next generation and all future generations. As such, it is considerably less "selfish" than the intimacy of the previous stage: Intimacy, the love between lovers or friends, is a love between equals, and it is necessarily reciprocal. Oh, of course we love each other unselfishly, but the reality is such that, if the love is not returned, we don't consider it a true love. With generativity, that implicit expectation of reciprocity isn't there, at least not as strongly. Few parents expect a "return on their investment" from their children; If they do, they aren't very good parents! Although the majority of people practice generativity by having and raising children, there are many other ways as well. Erikson considers teaching, writing, invention, the arts and sciences, social activism, and generally contributing to the welfare of future generations to be generativity as well. This is the stage of the "midlife crisis." Sometimes men and women take a look at their lives and ask that big, bad question "what am I doing all this for?" Notice the question carefully: Because their focus is on themselves, they ask what, rather than whom, they are doing it for. In their panic at getting older and not having experienced or accomplished what they imagined they would when they were younger, they try to recapture their youth. Men are often the most flambouyant examples: They leave their long-suffering wives, quit their humdrum jobs, buy some "hip" new clothes, buy a Porsche, and start hanging around singles bars. Of course, they seldom find what they are looking for, because they are looking for the wrong thing! Maladaptive tendency in this stage was called Overextensions. Some people try to be so generative that they no longer allow time for themselves, for rest and relaxation. The person who is overextended no longer contributes well. More obvious is the malignant tendency which Erikson calls rejectivity. Too little generativity and too much stagnation and you are no longer participating in or contributing to society. And much of what we call “the meaning if life” is a matter of how we participate and what we participate. If you are successful at this stage, you will develop a virtue which is the capacity for caring that will serve you through the rest of your life. This last stage, referred to delicately as late adulthood or maturity, or less delicately as old age, begins sometime around retirement, after the kids have gone, somewhere around 60 years old in our society. Some older folks will protest and say it only starts when you feel old and so on, but that's an effect of our youth-worshipping culture, which has even old people avoiding any acknowledgement of age. In Erikson's theory, reaching this stage is a good thing, and not reaching it suggests that earlier problems retarded your development! The task is to develop ego integrity with a minimal amount of despair. This stage, especially from the perspective of youth, seems like the most difficult of all. First comes a detachment from society, from a sense of usefulness, for most people in our culture. Some retire from jobs they've held for years; others find their duties as parents coming to a close; most find that their input is no longer asked for or required. Then there is a sense of biological uselessness, as the body no longer does everything it used to. Women go through a sometimes dramatic menopause; Men often find they can no longer "rise to the occasion." Then there are the illnesses of old age, such as arthritis, diabetes, heart problems, concerns about breast and ovarian and prostrate cancers. There come fears about things that one was never afraid of before - the flu, for example, or just falling down. Along with the illnesses come concerns of death. Friends die. Relatives die. One's spouse dies. It is, of course, certain that you, too, will have your turn. Faced with all this, it might seem like everyone would feel despair. In response to this despair, some older people become preoccupied with the past. After all, that's where things were better. Some become preoccupied with their failures, the bad decisions they made, and regret that (unlike some in the previous stage) they really don't have the time or energy to reverse them. We find some older people become depressed, spiteful, paranoid, hypochondrical, or developing the patterns of senility with or without physical bases. Ego integrity means coming to terms with your life, and thereby coming to terms with the end of life. If you are able to look back and accept the course of events, the choices made, your life as you lived it, as being necessary, then you needn't fear death. Although most of you are not at this point in life, perhaps you can still sympathize by considering your life up to now. We've all made mistakes, some of them pretty nasty ones; Yet, if you hadn't made these mistakes, you wouldn't be who you are. If you had been very fortunate, or if you had played it safe and made very few mistakes, your life would not have been as rich as is. The maladaptive tendency in stage eight is called presumption. This is what happens when a person “presumes” ego integrity without actually facing the difficulties of old age. The person is old age believes that he alone is right. He does not respect the ideas and views of the young. The malignant tendency is called disdain, by which Erikson means a contempt of life, one’s own or anyone’s. The person becomes very negative and appears to hate life. Good balance will leads to the development of the virtue which Erikson calls wisdom. Someone who approaches death without fear. He calls it a gift to children, because "healthy children will not fear life if their elders have integrity enough not to fear death." Lucas, Maria Rita; Corpus, Brenda. Facilitating Learning: A metacognitive Process. Lorimar Publishing Inc. pp. 35-54.